21-years old María Ólafs (María Ólafsdóttir) comes from Blönduós, small town of less than 1,000 inhabitants in Northern Iceland, and has been singing as long as she remembers herself. She studies in "Verzlunarskóla Íslands" collage. 10 years ago she has started playing in both professional and amateur theater productions in the country, including "The Sound of Music" at Borgarleikhúsið, "The Message Pouch" at the National Theater, "Michael Jackson" at Broadway and "V.Í Will Rock You" at her college Verzló. Currently she is playing Ronja the Robber's daughter in "Bæjarleikhúsid" in Mosfellsbæ. Since age of 5 she has also been active as a dancer. In 2013 María has released single "Lýsi í myrkri" with Kristmundur Axel. For the last 5 years she has often been collaborating with production group StopWaitGo: Pálmi Ragnar Ásgeirsson, Ásgeir Orri Ásgeirsson and Sæþór Kristjánsson. This year they have proposed María to participate with their track in the national preselection for Eurovision Song Contest. "They are masters and know me and my voice so well so I knew that the song would totally suit me. I was completely fascinated by it from the beginning", says the singer. The song, originally titled "Lítil skref" (Small steps) was translated into English for the national final and Eurovision. "My song is a power ballad and is very emotional. It is about a break-up and the girl is singing that she won't let this break her down. She will get through this and she will be stronger in the end, because she is a fighter"
Runner-up of the national selection, Friðrik Dór Jónsson, and participant of Eurovision 2010 Hera Björk Þórhallsdóttir will be added as backing vocalists for "Unbroken" in Vienna. Other two backing vocalists are Alma Rut and Íris Hólm. It means that dancers - Þórey Birgisdóttir & Ellen Margrét Bæhrenz, who have performed with María at the national final stage, will not reappear in Vienna. Two times Eurovision contestant, Selma Björnsdóttir will choreograph the act. 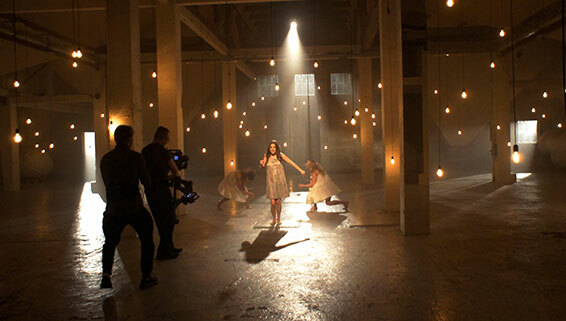 The music video was directed and produced by IRIS Films (Andri Páll Alfreðsson, Jakob Gabríel Þórhallson, and Jónas Bragi Þórhallsson), and choreographed by Stella Rósenkranz. Parts of the video where filmed in an old cement factory in Akranes, West Iceland. Other scenes where filmed in Korpúlfsstaðir in Reykjavík, once the country's largest dairy farm. It's March, and it means it is time now for a new season of interviews is starting. We're as usual cooperating in the interviews publication between a leading Eurovision website ESCKAZ.com, which organizes and publishes most important highlights of the interviews in English and Russian and one of the biggest official Eurovision fan clubs OGAE Rest of the World, which will host on it's Facebook page complete versions of the interviews in English. First one in this series is representative of Iceland María Ólafs. "I feel the pressure and the responsibility and I am actually very nervous about this big opportunity. I was unknown in Iceland before I won Söngvakeppnin and now I will be standing on this big stage in a few weeks. This is a very big dream coming true"
At the Eurovision in Vienna María will perform song titled "Unbroken", which she describes as "honest story about healing after a break up". María explains that her songwriters, Pálmi Ragnar Ásgeirsson, Ásgeir Orri Ásgeirsson and Sæþór Kristjánsson from Stop Wait Go team, have written the song specially for her and Eurovision participation, and in doing so they were using inspiration coming from their own lives. 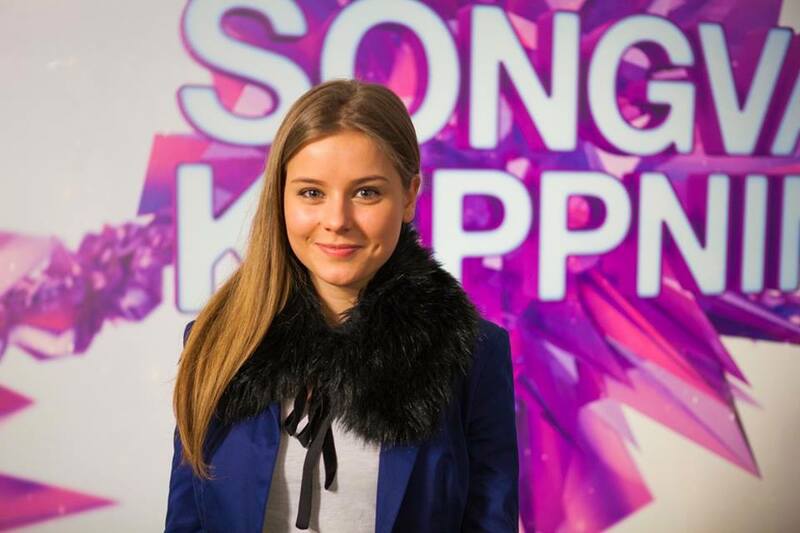 At the initial stage of selection song was performed in Icelandic as "Lítil skref", but for the national final and international competition it has been translated in English. "We wanted to sing in English because we wanted people to understand what I am singing about. The song is about someone gathering strength after a hard break up. In Icelandic noone in Europe would understand what I am singing about", says María. "The video will be premiered in a few days and it is to remain a secret until then. But I can tell you that we shot it for example in an old factory for cement that has been closed for years. And I can tell you that the video will be extremely cool :) The people behind making the video call them selves Iris and they went to the same school as I and are even younger. They are the wonder kids of Iceland´s film industry"
María says at Eurovision she is first of all aiming on people liking the song and her performance. María, who already took part in several music competitions in primary and high schools says she enjoys competing, because it gives an extra pressure. "At Eurovision I would love to get to the final and be part of the big show", she says, admitting "I heard there are a lot of good songs this year. It is going to be tough". Complete version of the interview in English can be found on OGAE Rest of the World Facebook page. 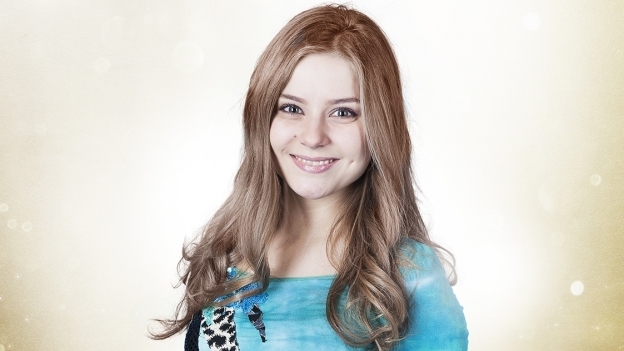 Preparations for the Eurovision Song Contest 2015 have been going well for Icelandic contestant, María Ólafs. She and songwriter Ásgeir Orri from StopWaitGo are now in Moscow where they will perform at a Eurovision gala concert today, Saturday, April 24. Among artists performing are the Tolmachevy sisters (ESC 2014), Zdob și Zdub (ESC 2005 & 2011), and 2011 winner Eldar Gasimov (Ell & Nikki), with 2015 contestants from Azerbaijan, Malta, Israel, Montenegro, United Kingdom, Australia, Belarus, and Macedonia. From Moscow, Maria and Ásgeir will travel to London and then back home to Iceland on Monday. A special dance mix of Unbroken was released earlier this week. This version of the song will undoubtedly be popular at the Euro Club and the Euro Café this year. Download it here. 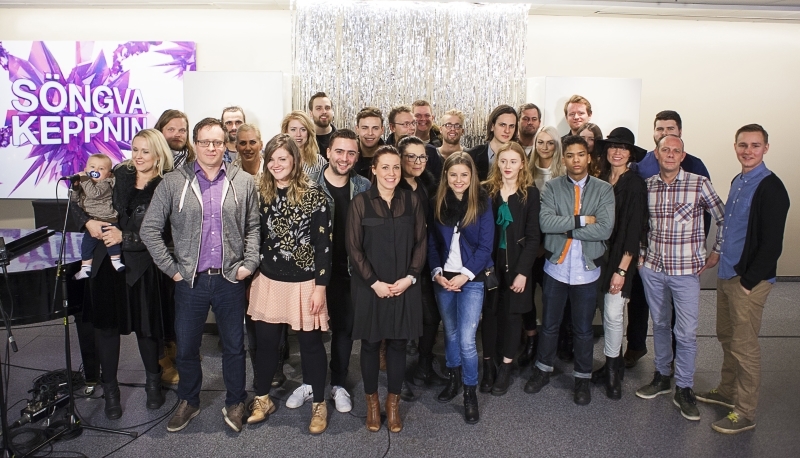 Icelandic national broadcaster RÚV has today started airing annual preview show "Alla leið". Program is hosted by star of Icelandic television, radio and theatre, Felix Bergsson, assisted by Iceland’s very own ‘Dr Eurovision’, Reynir Þór Eggertsson. All in all, there will be 5 weekly shows broadcasted where panellists assisted by studio audience of fan club FÁSES will select qualifiers and 5th show being a summary looking into "Fantasy Eurovision final" and choosing overall winner. Guests of the first episode were Dr. Gunni and Svanhildur Holm Valsdóttir. Watch shows here: 1st show, 2nd show, 3rd show, 4th show, final. Pálmi Ragnar Ásgeirsson, one of the authors of the Icelandic in the Eurovision Song Contest, says that instead of having dancers María Ólafsdóttir will rely more on the backup vocals. It was done based on the advice of professionals the team has consulted with, who recommended to get in the team more professional backing singers. "We want to strengthen the song," says Palmi. "It's really hard to make the song sound good live on TV - it does not matter whether it is the Super Bowl or Eurovision - and we want to do everything to strengthen the song." One of the dancers originally scheduled to perform with María has stated in an interview with DV that this was quite a shock decision because their families had already both bought tickets to Vienna and six of her family had rented a house to stay during competition. Pálmi Ragnar says in an interview that the team is very willing to cater to families. "We want to help them as far as possible and try make them as comfortable as it can be.". 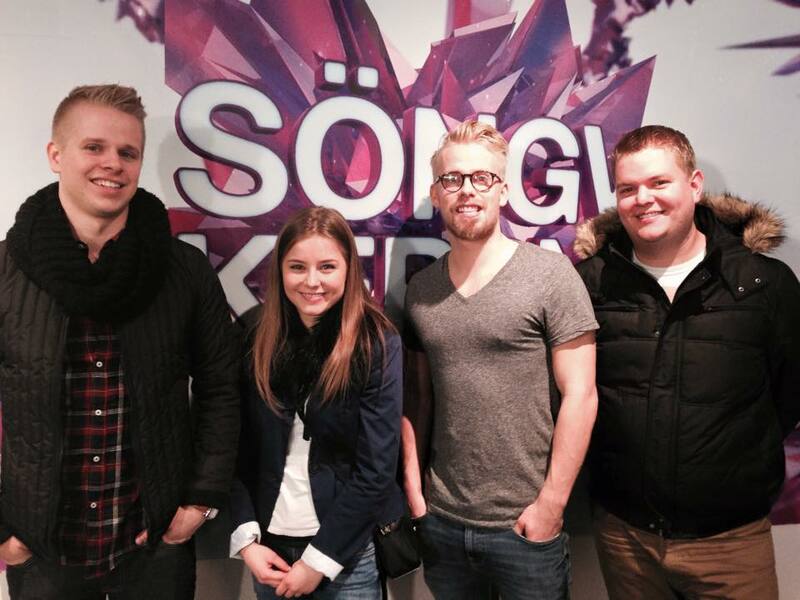 Twelve songs will compete in "Söngvakeppnin 2015" - national preselection for Eurovision Song Contest 2015. 6 songs will take part in each Semi-Final on 31 January and 7 February 2015. The Final will take place on 14 February 2015. All shows will be held at the Háskólabíó venue in Reykjavík, hosted by Ragnhildur Steinunn Jónsdóttir, Guðrún Dís Emilsdóttir and Salka Sól Eyfeld. Submission period for the shows run from 26 September to 27 October 2014 (extended from original date of 20 October). Songwriters were required to be Icelandic or possess Icelandic citizenship, though minor collaborations with foreign songwriters were permitted. Composers had the right to submit up to two entries. Initially, RÚV included a new rule that would require 50% of the selected competing songs to be composed by females. Following public criticism the rule was revoked. 258 entries were received (which is slightly less than 297 in 2014) and the 12 competing artists and songs were revealed during a press conference on 8 January 2015. More than half of the participants of "Söngvakeppnin 2015" are newcomers to the preselection, 14 out of 26 composers and 9 out of 16 performers have not competed before. The youngest songwriter and performer of the year, Elin Sif Halldórsdóttir, is only 16 years old. Read more about participants here. Competing entries were published on Friday, 23 January, 11.00 CET. Tickets for the shows will be on sale starting 22 January at midi.is. Official compilation album has been released by Hands Up Music on 2 February and is available on iTunes and Spotify. 21-летняя Марии Олафс (Марии Олафсдоттир) из Блёндюоуса, небольшого городка на севере Исландии с примерно 1000 жителей, поет столько, сколько помнит себя с детства. Она учится в колледже "Verzlunarskóla Íslands". 10 лет назад она начала играть в профессиональных и любительских театральных постановках в Исландии, включая "The Sound of Music" в Borgarleikhúsið, "The Message Pouch" в Национальном Театре, "Michael Jackson" на Broadway и "V.Í Will Rock You" в ее колледже Verzló. В настоящее время она играет главную роль в "Ronja the Robber's daughter" в "Bæjarleikhúsid" в Мосфедльсбайре. С 5 лет она также занимается танцами. В 2013 году Мария записала сингл "Lýsi í myrkri" вместе с Kristmundur Axel. Последние 5 лет Мария часто сотрудничает с продюсерской группой StopWaitGo: Палми Рагнаром Асгейрссоном, Асгейром Орри Асгейрссоном и Сетором Кристьянссоном. В этом году они предложили Марии принять участие с их песней в национальном отборе на конкурс Евровидение. "Они - настоящие мастера своего дела, и отлично знают меня и мой голос, потому я с самого начала была уверена, что песня мне подойдет. С первого прослушивания я была очарована ею", рассказывает певица. Песня, первоначально названная "Lítil skref" (Маленькие шаги) была переведена для участия в национальном финале и Евровидении на английский язык. "Моя песня - мощная баллада и очень эмоциональная. Она рассказывает о разрыве в отношениях, и девушка-героиня поет о том, что не позволит этому разрыву подавить ее. Она пройдет через эту черную полосу и в конце-концов станет только сильнее, потому что она - боец"
Фридрик Дор Йонссон, занявший второе место на национальном отборе, и участница Евровидения 2010 Хера Бьорк Торхаллсдоттир будут добавлены в число бэк-вокалистов Марии Олафс в Вене. Другие два бэк-вокалиста: Алма Рут и Ирис Холм. Таким образом, на сцене Вены не смогут появиться танцоры, выступавшие на национальном отборе: Торей Биргисдоттир и Эллен Маргрет Бехренц. Двухкратная конкурсантка Евровидения, Сельма Бьорнсдоттир, станет постановщиком номера. Видеоклип на конкурсную песню был снят компанией IRIS Films (Андри Палл Алфредссон, Джакоб Габриел Торхаллсон и Йонас Браги Торхаллсон), хореограф видео Стелла Розенкранц. Часть клипа была снята на заброшенном цементном заводе в Акранесе, Западная Исландия. Остальные сцены были сняты в Корпулфсстадир в Рейкьявике, когда-то бывшей крупнейшей молочной ферме страны. Наступил март, а значит пришло время для нового сезона интервью с участниками конкурса Евровидение. Как обычно, в рамках публикации интервью будет происходить сотрудничество между крупнейшим вебсайтом о конкурсе Евровидение ESCKAZ.com, который организовывает и публикует обработанные версии интервью на русском и английском языках, и официальным фан-клубом Евровидения ОГАЕ Остальной мир, который на своей Facebook странице будет размещать полные тексты интервью на английском языке. Первая наша гостья - представительница Исландии Мария Олафс. "Я чувствую давление и ответственность, и на самом деле я очень нервничаю по поводу этой большой задачи. Когда я принимала участие в национальном отборе Söngvakeppnin в Исландии, я еще была никому неизвестной певицей, и вот через несколько недель мне предстоит выйти на такую огромную международную сцену. Сбывается моя самая главная мечта в жизни"
На Евровидении в Вене Мария исполнит композицию "Unbroken", которую она описывает как "искреннюю историю о залечивании ран после расставания". Мария объясняет, что авторы ее песни - Палми Рагнар Асгейрссон, Асгейр Орри Асгейрссон и Сетор Кристьянссон из команды Stop Wait Go, написали данную песню специально для нее и ее участия в Евровидении, при этом черпая вдохновение из собственных жизненных ситуаций. На первоначальной стадии отбора песня была исполнена на исландском языке под названием "Lítil skref", но, для национального финала и международного конкурса она была переведена на английский язык. "Мы хотели исполнить песню на английском, чтобы как можно большее количество людей поняло, о чем я пою. Моя песня рассказывает о том, как девушка набирается сил после расставания, которое было очень тяжелым ударом для нее. Если бы я пела на исландском, то ведь никто из жителей Европы бы не понял, о чем говорится в моей песне", поясняет Мария. "Премьера клипа пройдет в ближайшие несколько дней, и до этого момента его сюжет не разглашается. Но я могу рассказать, что съемки прошли на старом цементном заводе, который был закрыт уже многие годы. Также, я считаю, что видео получилось очень классным :) Съемочная группа, работавшая на нем, называет себя Iris, и, оказывается что они ходили в ту же школу, что и я, и даже младше меня по возрасту. Они - вундеркинды исландской киноиндустрии!" Мария говорит, что на Евровидении она прежде всего хочет, чтобы людям понравилась ее песня и выступление. Принимав ранее участие в ряде музыкальных конкурсов на школьном и институтском уровне, певица любит соревнования, потому что они добавляют давления, а вместе с ним и адреналин. "Конечно же, на Евровидении я бы хотела выйти в финал и стать участницей главного шоу", говорит она, при этом признавая "Я слышала, что в этом году на конкурсе множество хороших песен. Будет сложновато". "Оставайтесь честными и будьте счастливы :)"
С полным текстом интервью (на английском языке) вы можете познакомиться на Facebook странице ОГАЕ Остальной мир. Исландский национальный вещатель RÚV приступил сегодня к показу ежегодного превью шоу "Alla leið". Ведет программу звезда исландского телевидения, радио и театра Феликс Бергссон, которому помогает местный эксперт по Евровидению Рейнир Тор Эггертссон. Всего в эфир выйдет 5 еженедельных программ, где различные члены жюри, при помощи зрительской аудитории, состоящей из членов фан-клуба FÁSES будет выбирать финалистов, а в 5м шоу будет рассмотрен виртуальный финал Евровидения и определен его победитель. Записи программ вы можете увидеть здесь: 1е шоу, 2е шоу, 3е шоу, 4е шоу, Финал. Палми Рагнар Асгейрссон, один из авторов исландсокй песни для Евровидения 2015, рассказал, что вместо танцоров, в номере Марии Олафсдоттир будет задействовано большее количество бэк-вокалистов. Это было сделано по совету профессионалов, с которыми консультируется делегация Исландии, и которые рекомендовали добавить в номер больше профессиональных бэков. "Мы хотим усилить песню," говорит Палми. "Очень сложно сделать, чтобы песня хорошо звучала в прямом телевизионном эфире - не важно Super Bowl это или Евровидение - и потому мы прилагаем все усилия для этого." Одна из танцовщиц, которая должна была выступить с Марией на сцене, заявила в интервью DV, что они были шокированы данным решением, поскольку их семьи уже приобрели билеты до Вены и шесть членов ее семьи сняли дом для проживания во время конкурса. Палми Рагнар отвечает, что команда сделает все возможное о том, чтобы позаботиться о бывших участниках номера и их семьях: "Мы постараемся помочь им насколько это возможно, чтобы они чувствовали себя так комфотно, как это только может быть.". В "Söngvakeppnin 2015" - национальном отборе Исландии на Евровидение 2015 примет участие 12 песен. 6 из них будут исполнены в каждом из полуфиналов отбора 31го января и 7го февраля. Финал пройдет 14го февраля. Все шоу отбора пройдут в зале Háskólabíó в Рейкьявике, их ведущими выступят Рагнхилдур Стейнунн Йонсдоттир, Гудрун Дис Эмильсдоттир и Салка Соль Эйфелд. Период приема заявок на участие в шоу продлился с 26го сентября по 27 октября 2014 года (он был продлен на неделю с первоначальной даты 20 октября). Участвующие авторы должны были либо быть гражданами Исландии, либо ее уроженцами, хотя допускались небольшие сотрудничества с зарубежными соавторами. Каждый из участвующих композиторов мог подать не более двух заявок. Первоначально, телеканал RÚV включил в отбор новые правила, предписывающие, что 50% песен, отобранных для участие в шоу, должны были быть написаны женщинами-композиторами. Однако, после общественной критики, это правило позднее было снято. Всего было получено 258 заявок (что несколько меньше 297 в 2014 году). 12 участвующих артистов и их песни были названы во время пресс-конференции 8го января 2015 года. Более половины участников "Söngvakeppnin 2015" являются его дебютантами: 14 из 26 композиторов и 9 из 16 исполнителей примут участие в национальном отбор впервые. Самой младшей участницей среди композиторов и исполнителей является 16-летняя Элин Сиф Халлдорсдоттир. Подробнее с участниками отбора можно познакомиться здесь (на английском языке). Участвующие песни были опубликованы в пятницу, 23го января, 13.00 Москвы. Билеты на шоу поступят в продажу с 3го января на сайте midi.is. Официальный альбом отбора был выпущен компанией Hands Up Music 2го февраля и доступен на iTunes и Spotify. it's either now or never.